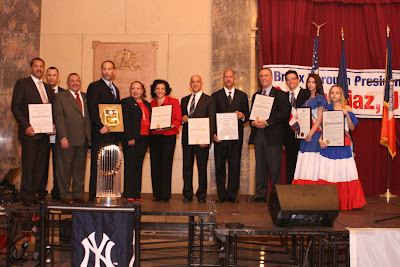 Last week, Bronx Borough President Ruben Diaz Jr., and La Gran Parada Dominicana de El Bronx, Inc., hosted the the Bronx's Dominican Heritage Celebration. Dominican leaders Angela Cooper (educator), Adalberto Dominiguez (journalist/photogrpaher), Julio Gaspar Isidor, general manager of Cibao Meat Products and restaurant owner Chelo Ramirez were honored by Diaz. There was also a special tribute to the New York Yankees who displayed the World Series trophy as part of the event. The celebration also featured a performance by El Maestro Will Lapache, along with traditional food and Dominican Folkloric dancing.